Something is horribly wrong with my internet connection. I’m loading and reloading web pages, checking and rechecking my email on the treacherous MS Outlook, starting and restarting my router…and yet still, the connection remains tenuous, sporadic, wonky. I sigh noisily in frustration. How can I work?? How can I do anything?? Being almost fully dependent on the internet for my job, and being likewise dependent on it for my hobby (this blog), leaves me, as you can imagine, in quite the frazzled state when my ISP decides to toy with me. I can neither work nor play. As I sit here and write this though, offline, I scratch my head and think…when did I, when did we all, get so dependent on technology? I am part of that generation that straddled the time before the internet, and the time after. I used a typewriter during university to write my papers (no delete, no editing, no copy/paste, and no spell check). If I wanted to call my parents from school I used a payphone. Planning jaunts with friends was based on your word of honor, there was no possibility of “texting” to say you couldn’t make it or were running late. I can still remember those times so clearly, cast in the golden glow of a bygone era. I also remember clearly, the moment the internet arrived. We had dial-up (Oh that strange dial-up screech!) and I thought it was the cat’s meow. There were prehistoric chat rooms, all monochrome and basic, with none of the Technicolor bells and whistles social media has today. There was my brother and I, jockeying for turns to “connect”. I remember my first mobile phone…huge, unwieldy thing. I remember the thrill of communicating through SMS. After that, in what seemed to be a blink of an eye, although it’s really been decades, this new way to connect and communicate gained such size and speed and fantastical proportions that now many cannot imagine the world before it. And as I sit here anxiously checking if the connection is up and running, I take a step back, a deep breath, and a little reality check. There’s a reason it’s called “virtual”. A lot of the times, best kinds of connections and the real and old fashioned ones. A hug, a kiss, eye contact, a hand on an arm in emphasis, or one on the back for guidance and protection while crossing the street, your baby’s little hand grasping your finger with surprising strength, your dog’s warm body beside you in bed, a sonnet read aloud, happy tears, the way your mom smells. Baking cookies for your child’s last day of school. – Whisk together the flour, baking soda, and salt in a bowl and set aside. – Melt the butter in a skillet until browned (not burned! ), with a warm nutty aroma. You can find a fantastic tutorial on browning butter over at Simply Recipes. Set aside to cool a bit. – Mix the butter and sugars in an electric mixer until thoroughly blended (give it a sniff…this mixture smells awesome, like all your candy dreams come true!). Beat in the egg, egg yolk, vanilla, and yogurt until combined. To this, slowly add the dry ingredients and beat on low speed until just combined. Gently fold in the chocolate chips. – Place the cookie dough in the refrigerator overnight (which I now try to do with all my chocolate chip cookie dough since this), or at least for 2 hours (to chill enough so you can form the dough). – Once the dough is chilled measure about 1 1/2 tablespoons of dough and roll into a ball. Flatten the dough very thinly into the palm of your hand. Place 1 teaspoon of the chilled Nutella in the middle and wrap the dough around it. Gently roll the ball and make sure that the Nutella is not seeping out anywhere. Use little bits of dough to patch up any holes. – Place the dough balls 2 inches apart on a parchment-lined baking sheet (I don’t feel the need to flatten the dough anymore as per the original recipe). 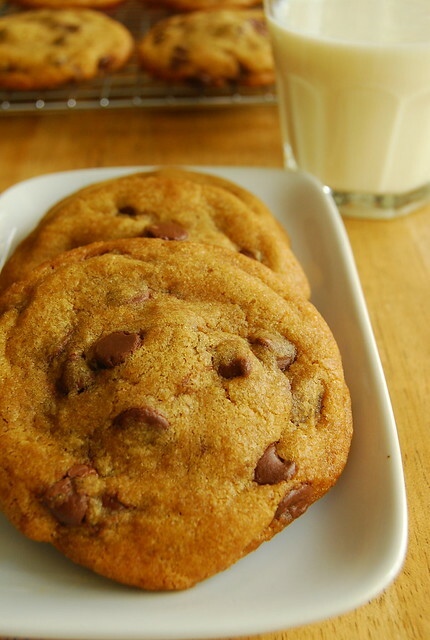 Bake in a pre-heated 350F oven for 9-11 minutes or until the edges of the cookie begin to turn golden brown. They will look a bit underdone in the middle but that’s ok, they will continue to cook out of the oven. – Cool the cookie on the pans for about 2 minutes then sprinkle with a little se salt. Transfer the cookies to a wire rack to cool completely. These cookies were a resounding success with little C’s classmates and teachers. I didn’t put any sea salt on the batch I sent to school with her but I did try some with and it is toe-curling good. Really. 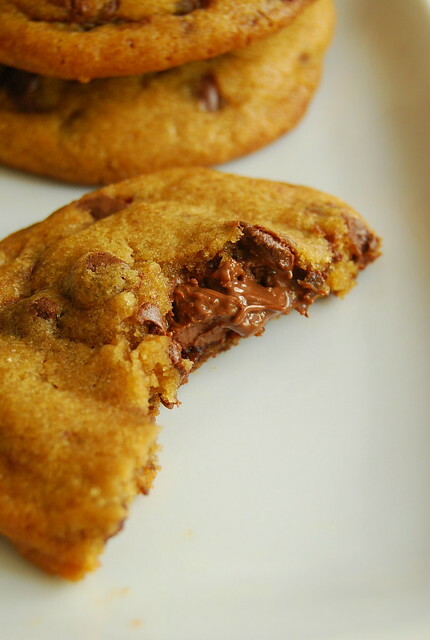 The cookie itself resonates with that nutty burnt caramel flavor you get from brown butter and the chewy, Nutella-seeping center can cure a myriad of ills. This is now tied in first place for my favorite along with THIS one. Like will most of the cookies I make, I only bake what I will use and freeze the rest of the dough, either in logs, or in the case of these Nutella-stuffed ones, in balls. I can think of no greater comfort that knowing you have frozen cookie dough in your freezer, for, you know, “emergencies”. Albeit I don’t get to do it that often, what with work and life and all that jazz, I love this act of making something for my child to bring to school and share with her friends. Just the very old-fashioned, home-and-hearth-ness of it makes me feel I am giving her something good and solid (despite the fact that what I am really giving her is chocolate and sweets!). It also, I fervently hope, makes up for the fact that I will most likely never teach her to finger-paint or do origami. Don’t be misled though, I am in no way of the camp that decries the internet as “evil”. I love the internet! Which should be obvious as sit here and post on my blog…an activity that would be impossible without the internet and has, for me, lost none of its charm. I love how it has given me another way to reach out, interact, and connect with people I would have otherwise never had the chance to. It can truly be a wonderful tool. But it is only one of many. And even with the frustration of dealing with an iffy connection when you are trying to get work done, I am happy to be reminded of that. Addictive, I'm sure! These are wonderful cookies. I think thats so yummy!! Hi Simone! It truly is incredible how much has happened technology-wise in such a seemingly short span of time! I can still remember the days of dial-up 'net and my ice-shaver-sized Nokia 100 which, at the time, made me the most tech and fashion-forward girl at university! Hi Midge! Yes!! I remember my first mobile which must have been as big as those old school walkie-talkies! These look divine. I swear I could smell the doughy, nuttela emanating from my computer screen. I just gotta make these.